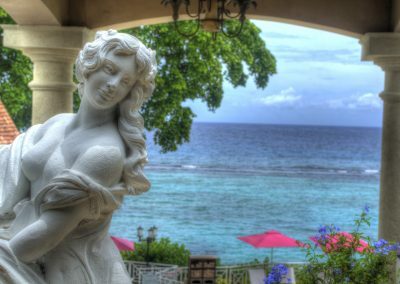 If you are looking for a boutique, quite, romantic Sandals all inclusive resort with butler service this is the perfect resort for you. 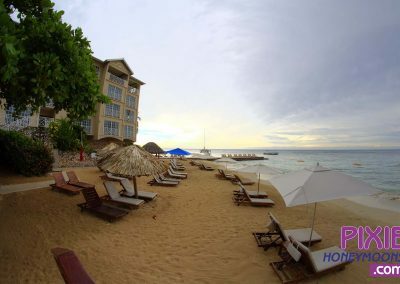 It also offers the music, nightlife and swim up bar just next door at Sandals Ochi Beach Resort. You can literally wade over to Sandals Ochi next door, or take the Sandals shuttle which is free. 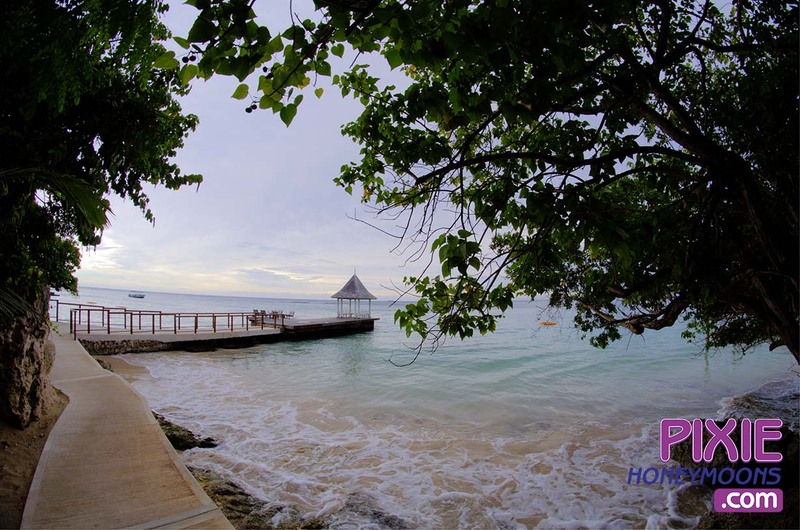 We would spend time at Sandals Ochi at the swim up bar and take “The Hop” free shuttle to the mountain side part of the Ochi resort for some amazing Jerk Shack pork and Chicken for lunch. Then later in the day we would head back to Sandals Royal Plantation for a quite relaxing evening. If you still want night life, just head to Sandals Ochi for the Beach Party. Looking for the ultimate in Caribbean all inclusive luxury? 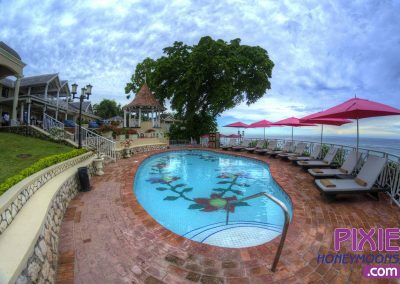 Sandals Royal Plantation has a 3-bedroom villa (Villa Plantana) tucked away on the resort property. You get to enjoy the entire resort AND your private villa, private pool, own beach access, and your own butler and chef. Over-the-water hammocks & swings have been added along with a swing bed. These are so relaxing. This Sandals resort is located in Ocho Rios which is that part of Jamaica that has all of your fun outdoor activities like swimming with dolphins, climbing Dunn’s river falls and hiking or zip lining in the tropical forest. 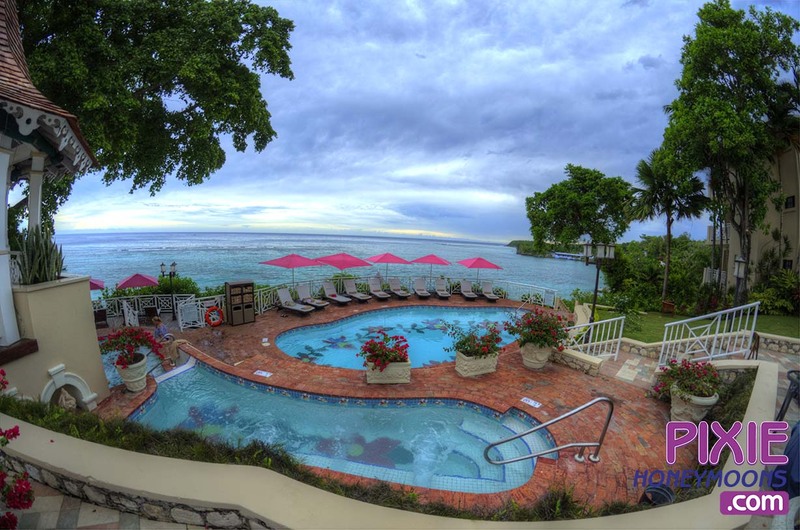 But even being in the heart of all that Ocho Rios has to offer, Sandals Royal Plantation is a boutique resort with just 74 suites on the 10 acre property. All the suites have ocean views and you are situated on a cliff over looking the cove beaches below and amazing emerald green and blue Caribbean waters. 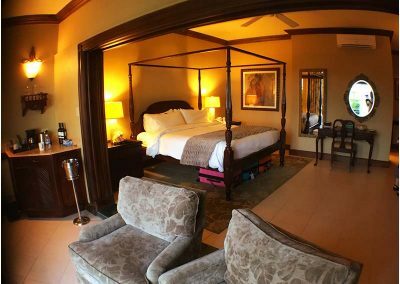 We stayed at Sandals Royal Plantation when it was sold out. The resort has so many dining options and hidden nooks on the two beaches that we never saw more than three of four couples the entire stay. 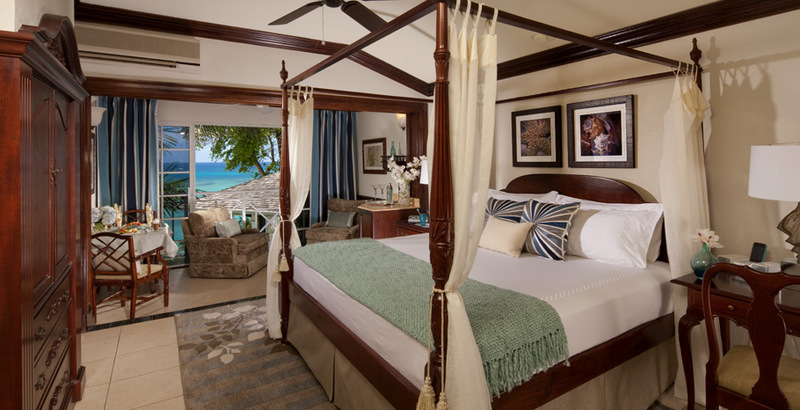 Sandals Royal Plantation also has a private 3 bedroom villa that is tucked away in a lush garden on the secluded east beach. We toured this amazing villa that was also on the season finally of ABC’s the Bachelor. This Sandals villa also comes with butler service and also a chef. It has a private pool and beach access. 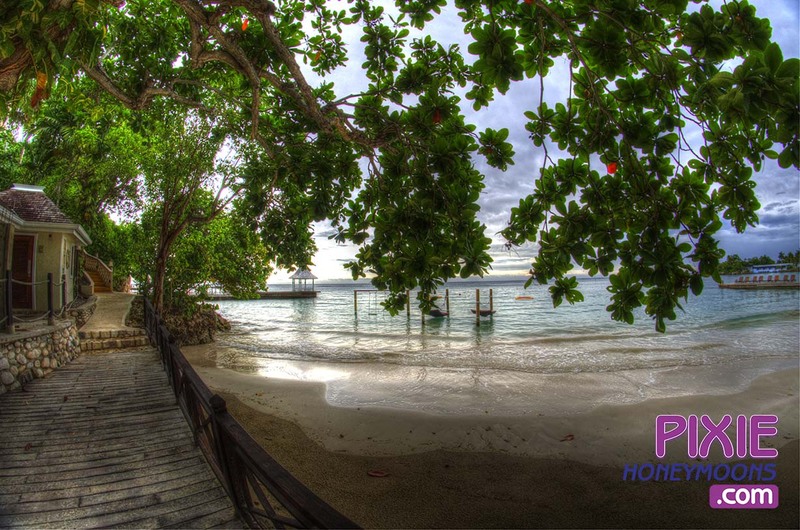 There is a hidden path just steps away from Sandals Royal Plantation where you can dine, and relax also. If you are interested in the Villa I have loads of photos I can share with you. 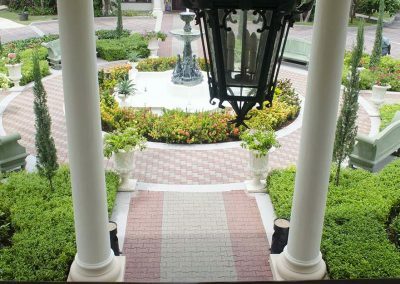 It’s an amazing place for a honeymoon, wedding, or gathering with friends. 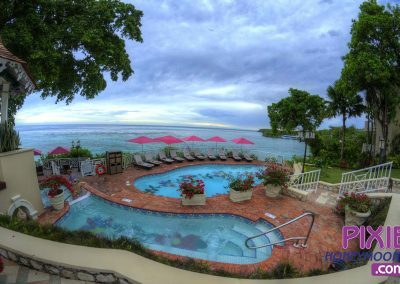 Another advantage to Sandals Royal Plantation is that it has full exchange privileges with Sandals Ochi Beach Resort which is next door. Guests staying at Sandals Ochi Beach Resort do NOT have exchange privileges to Sandals Royal Plantation. We waded over to Sandals Ochi next door several times and also took the free shuttle. 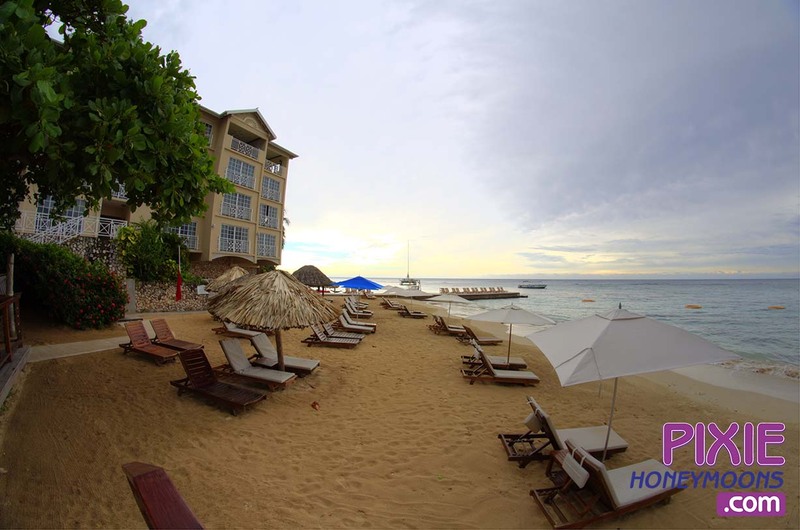 Sandals Ochi Beach Resort is the Sandals resort you probably have seen in TV commercials and brochures. It has an amazing swim up bar, and large beach party area for daytime activities and nighttime events, and loads of restaurants. With Sandals Ochi next door you can hang out at the swim up bar during the day if you like more activities, and head back to your resort when you want to relax. You have the best of both worlds. Get to know your butlers. Having butlers gets a little getting use to, so be sure to bring your room phone with you to the beach, to Sandals Ochi, etc. If you left your book in your book and you are on the beach at Royal Plantation just give them a call. If you would like your cooler filled with beer by your beach chairs, or dinner reservations, etc. your butler can take care of everything for you. Sandals Royal Plantation has just 74 suites, 9 different categories to choose from. 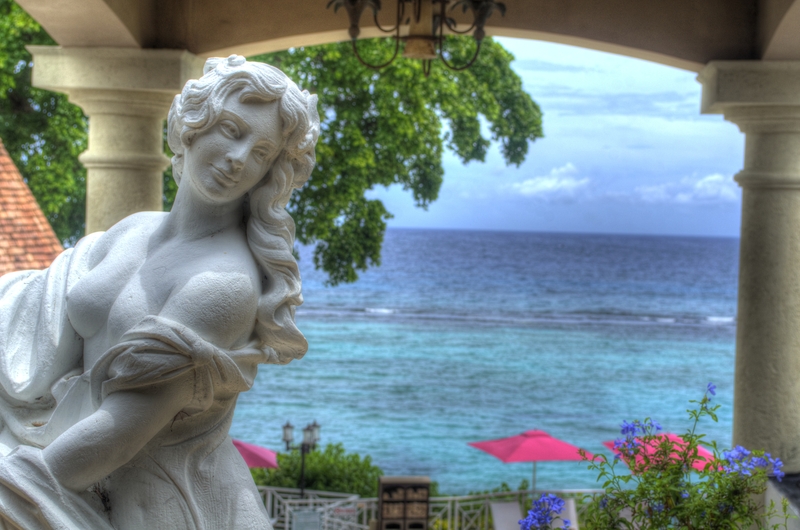 Statues and gardens surround Sandals Royal Plantation resort. Just down from the resort are two different beaches. This one is more secluded with a bed swing, and hammocks and swings over the water. The larger beach at Sandals Royal Plantation is very quaint and has two butlers ready to get you drinks or anything you need. 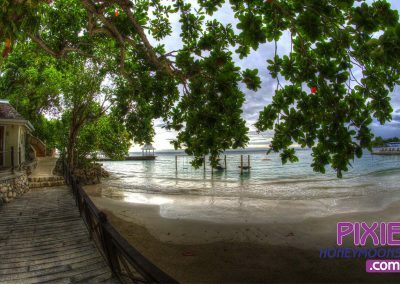 This is a perfect wedding spot and we saw a wedding take place here with a reception at the private Sandals villa. 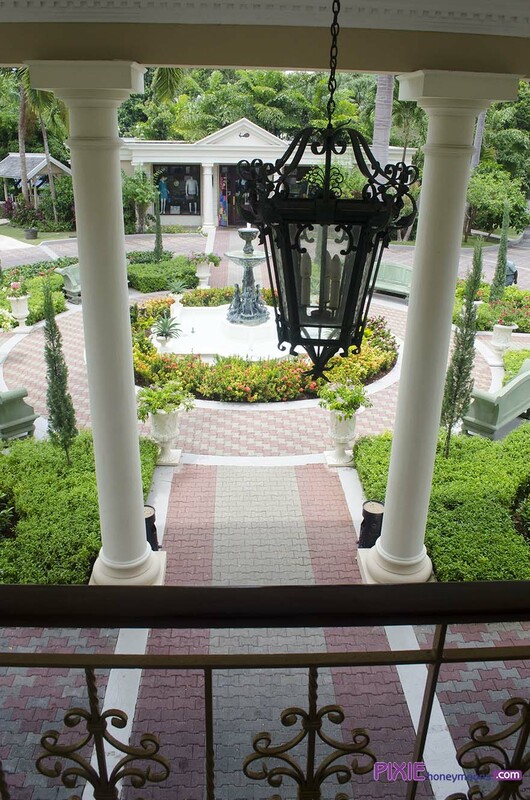 This boutique resort has a nice romantic pool and hot tub at the far end. There is also an ocean pool hidden down by the beach. 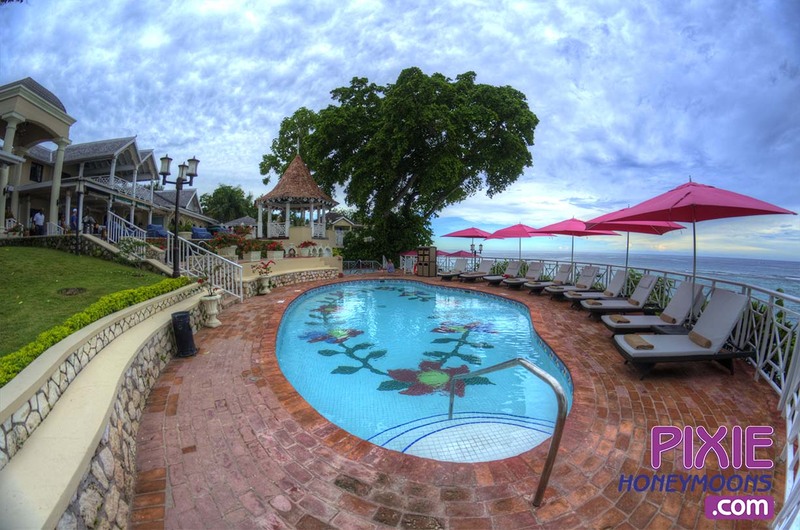 The Sandals Royal Plantation Hot Tub has two levels and it’s pretty much all yours to enjoy. We stayed at Sandals Royal Plantation when it’s 74 suites were sold out and as you can see we had no issues getting a spot by the pool. 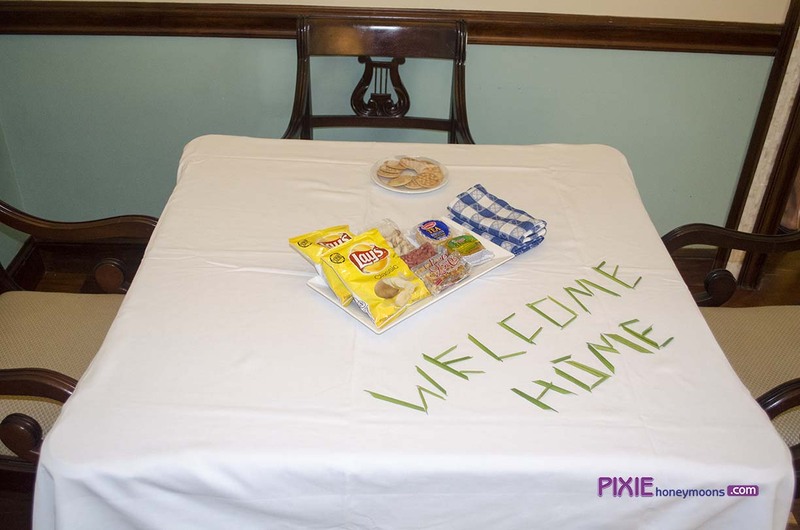 It’s the little touches that make it extra special. Your celebrated piece of paradise, situated in either the East or West wings on levels 1, 2 or 3, is framed by the broad, ornamental French balcony that opens to stunning views of the aquamarine Caribbean unfolding to the far horizon. Colonial design elements and modern conveniences merge to create an inspired, Island contemporary suite. An open-partition plan delineates elegant sleeping quarters from the charming living and intimate dining space, where a wall of glass frames palm trees, ocean and sky. Inside, enjoy an ultra-inviting signature king size, mahogany bed; primp in the marble-appointed bath; lounge on exquisitely upholstered easy chairs; and drink in the captivating vistas with morning coffee or evening cocktails. A discreet and attentive personal butler, whose impeccable attention to detail leaves nothing to chance, will cater to your needs for the duration of your memorable stay. Located on the top floor of the resort’s Beachfront West Wing, this exceptional Love Nest Suite grants breathtaking views of the serene sea. 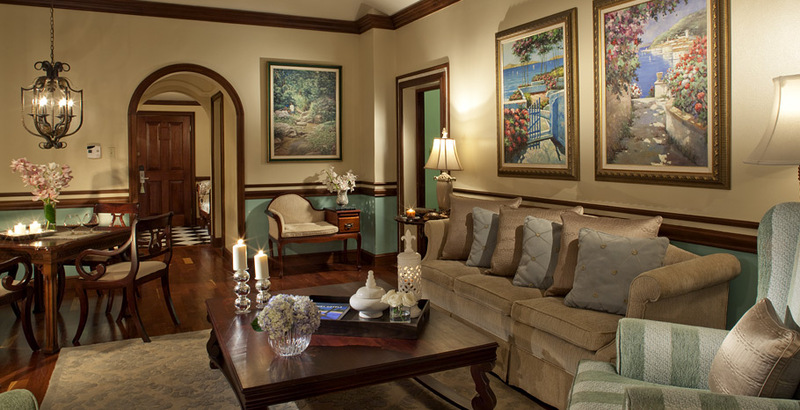 As stately as its title, this exceptional escape is the essence of Caribbean sophistication. Enter into an elegant foyer that leads to a spacious living and dining area appointed with a cozy sofa, custom crafted mahogany furnishings, and fully stocked bar. The grand master bedroom features a four-poster, king-size bed with soft Italian linens and plush pillows for the ultimate sleep experience. The en-suite bath is complete with a double vanity, walk-in shower and Roman tub. Outside, the suites’ two walkout balconies invite you to relax and take in the vistas on a chaise lounge and bistro set. Butler Elite and 24-hour room service are included.